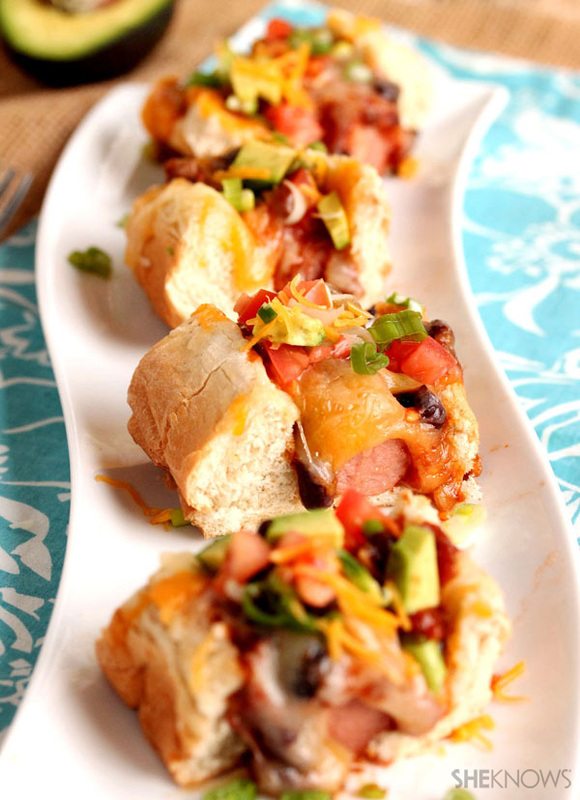 Don’t forget to invite these mini chili cheese dogs to your Super Bowl party. They’ll be the life of the party. I don’t know about you, but I love to eat when I’m at a Super Bowl party. And when I spot chili cheese dogs up for grabs, you can definitely count me in. These mini dogs are a perfect game day appetizer not only because they’re an American classic, but also because they taste SO darn good. Did I mention how easy these are to make? It’s a good thing too because your guests will eat them up so fast you’ll need to keep making more. Add all ingredients to an oval roasting pan and stir together. Bake in a preheated oven until desired thickness is reached (about 1 hour). If you prefer a thinner chili, add more water until desired consistency is reached. Cook the hot dogs on a grill or boil them in water. Put each hot dog in a bun. Cut each hot dog (and bun) in thirds. Top each hot dog with the hot chili either right out of the oven or reheated before use. Add the cheese over the hot chili. Top with the tomatoes, avocado and green onions. Serve the extra chili in small bowls for your guests to enjoy.